Water conditioners transform hard water into soft water through a process called ion exchange. Investing in one will allow you to say goodbye to a multitude of hard water problems in your home, such as stubborn and unsightly residues on bathroom surfaces, stiff clothing fibers, scale buildup inside water-using appliances, and visible spotting on your silverware, glasses, and dishes. Ideally, you want a water conditioner that is outfitted with advanced features, and designed to provide year after year of reliable performance. Since 1953, RainSoft has developed some of the finest water conditioning equipment in the world. Our newest model – the EC5 Series – is a next-generation water conditioner that capitalizes on the power of Wi-Fi technology. Using the RainSoft REMIND® app, which is available on iOS and Android mobile devices, you can monitor salt levels, receive service notifications, review system settings, and even schedule a time to have maintenance performed by your local authorized RainSoft dealer. Easy-to-read digital display – The EC5 Series water conditioner has a six-line liquid crystal display that provides easy-to-read system data on demand. Immediate touch response – Push any button to wake up the display and retrieve any awaiting messages or instructions. Automatic power outage recovery – If the power goes out during regeneration, the EC5 Series will automatically complete the interrupted regeneration cycle once power is restored so that soft water immediately becomes available. Energy-efficient operation – Because the system utilizes DC (direct current) power, it requires less electricity than water softeners from other manufacturers that all use AC (alternating current) power. Proportional regeneration cycles – The regeneration cycles that this water conditioner performs are calibrated to actual water usage inside the home. This helps to conserve salt, water, electricity, and money. Injection molded enclosures* – Precisely designed injection molded enclosures help to protect internal system components against the elements. The EC5 Series represents the latest in residential water softening technology. It combines all the benefits of soft water with the advantages of remote monitoring capability, an intuitive display, durable construction, and environmentally friendly operation. 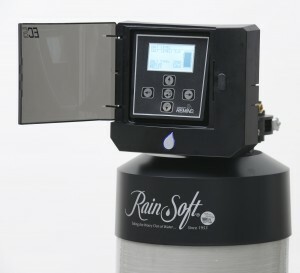 To learn more about the EC5 Series water conditioner from RainSoft, please contact your local authorized RainSoft dealer today.